"Mstislav Rostropovich, the indomitable bow’ wins the « Best Portrait Award » at FIFA 2018 ! Saturday, March 17th, 2018, the jury of the 36th edition of the International Festival of the Film on Art in Montreal awarded « THE BEST PORTRAIT AWARD » to Bruno Monsaingeon for his film "Mstislav Rostropovitch, the indomitable bow". An archive film which makes us discover the portrait of an exceptional and committed artist. A coproduction Ideale Audience, Arte and Pathé Production. With the participation of France Télévisions, Medici.tv, NRK, RSI, RTV Slovenia, ERR, RTBF, SVT, ORF, YLE. 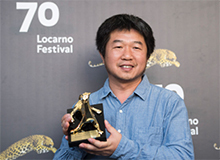 This year, the jury has awarded Chinese filmmaker Wang Bing's documentary "Mrs Fang" the Golden Leopard at the 70th anniversary edition of the Locarno Festival. The film focuses on the death of a woman with Alzheimer's in a impoverished corner in China. A production of Ideale Audience and Wil production, in coproduction withDocumenta 14, in association with Arte France - La Lucarne. Next broadcast on September 3rd, 2017 at 00:10 on Arte of "Astor Piazzolla, Tango Nuevo" Daniel Rosenfeld's new documentary. 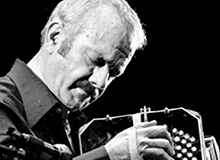 Astor Piazzolla, the man who changed tango forever with his New tango. This is an evocative journey to the core of Piazzolla's life ! A film produced by Françoise Gazio, in coproduction with Argentinacine, Arte France, Avrotros and INA. With the participation de SVT, YLE, ERR, SRF. Do not miss it ! Il Trionfo del Tempo e del Disinganno (HWV 46a) on France Televisions soon !! "The Nansen Passeport" broadcast soon on Arte. Thirty years after the Geneva Convention, inJuly 1922, the Norwegian diplomat Fridtjof Nansen created a passport to which he gave his name, and which, between 1922 and 1945, protected some thousands men and women, who found themselves stateless, without nationality, because of the events of the First World War, the Armenian genocide, and the Russian Revolution A film directed by Valentine Varela and Philippe Saada. Sunday April 10th, 2016 at 00:25 on Arte. Belà Bartok, Quartet n°4, Beethoven, the Große Fuge, Schönberg, Transfigured Night, these three ballets form a poetic and mysterious ensemble that is entering the Paris Opera Ballet’s repertoire this saison. Produced by Françoise Gazio, directed by Louise Narboni. A coproduction Idéale Audience, Paris National Opera and ARTE France with the participation of Mezzo and the support of CNC. and Feb 24th, 2016 at 22:55 (Cinekino 2). Film strolls between France and Germany. Two directors, native on both sides of the Rhine, Laurent Heyneman and Mathias Luthardt, explore the unique links which unite French and German cinemas for more than a century. Produced by Hélène Le Coeur. One coproduction ideale audience / Zero One Film / Arte GEIE. (2x 52'). Tuesday December 8th, 2015 at 23h40. The result of the elections of December, 2015 in Spain is a mystery. 40 years after the Transition, the violent systematic and economic crisis caused a political earthquake. Can Spain go until the change of regime ? A film written by Jaume Grau, directed by Sergio Ghizzardi, produced by Françoise Gazio and Joan Úbeda. A coproduction Idéale Audience, Media 3.14, ARTE France. (52 mn - 2015). "The Perfect American", an opera by Philip Glass broadcast soon ! On Sunday December 27th, 2015 at 2:20 am on Arte France. From the novel „ The Perfect American „ by Peter Stephan Jungk, this opera shows the Disney’s troubled portrait at the end of his life. A powerful and poignant subject for Philip Glass’s latest opera. With Christopher Purves as Walt Disney, David Pittsinger (Roy). Libretto by Rudy Wurlitzer. on Sunday November 1st, 2015 at 23:45 on Arte. "Rain" is a work of rare intensity and refined purity under the "Music for Eighteen Musicians", by Steve Reich, a quintessential work performed here by the Ensemble Ictus. Filmed at the Palais Garnier with the ballet of Opéra National de Paris.Directed by Louise Narboni, Produced by Françoise Gazio and Laurent Metivier. A production Idéale Audience,Opéra National de Paris, Arte France. with the participation of Mezzo and VRT and the support of Fondation Orange and CNC. Next broadcast on October 22nd, 2015 on France 2. Zürich Opera Orchestra under the baton of Mihai Tang, makes the pages be reborn which appear among the most famous of Bel Canto history. With Cécilia Bartoli (Desdemone) and John Osborn (Otello). Directed by Olivier Simonnet, produced by Pierre-Olivier Bardet. A coproduction Idéale Audience, Opernhaus Zürich. With the participation of Clasart Classic, Museec, France Televisions. on October 10th, 2015 at 00:25. An awarded and original production of Janacek’s opera. Filmed in the baroque decor of Les Bouffes du Nord in Paris, with a reduced piano version, incredibly talented young singers, this is an enchanted version, acclaimed by press and public. Directed by Louise Narboni, produced by Françoise Gazio. An coproduction Idéale Audience, CCIT - Théâtre des Bouffes du Nord. With the participation of France Télévisions and Museec. «Francofonia», by Russian director Alexander Sokurov, has been awarded by the Fedeora Jury as the Best European Film in Competition at the Venice International Film Festival. «Francofonia» is a complex film exploring themes of European culture in a challenging, sometimes confrontational, but always poetic voice » the jury of Fedeora, the Federation of film Critics of Europe and the Mediterranean, said in a statement. 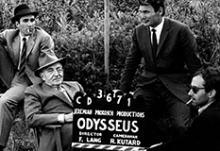 Coproduced by Idéale Audience, zero one films, N279 Entertainment, Louvre Museum and Arte Cinema. International Sales : Films boutique. 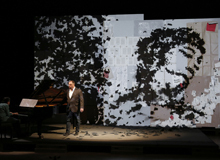 On Sunday, July 19th, 2015 at 00:20, the pianist Markus Hinterhaüser playing with the baritone Matthias Goerne in a magnificent "Winter journey", staged by the South-African artist William Kentridge. This documentary explores the reflections of each member of the trio on Schubert's work, revealing backstage this unexpected collaboration. A film directed by Christian Leblé, produced by Idéale Audience in coproduction with Festival d'Aix-en-Provence, Mezzo, Unitel with the participation of Arte France, Museec, Classica. Photo ©Marco-Borggreve. Fashions – The Polo Shirt by René Lacoste broadcast on Arte! on Sunday July 12th, 2015 at 12:00. A film by Muriel Edelstein, from an original idea of Collection by Anna-Célia Kendall. Comments co-written and recited by Farid Chenoune, writer and fashion historian. A production Idéale audience, Helene Le Coeur in coproduction with Arte France. Selected at International Festival of Films on Art in Montréal,2014. Fashions – The Gingham Dress by Jacques Estérel broadcast on Arte! on Sunday July 5th, 2015 at 12:00. A film by Muriel Edelstein and Anna-Célia Kendall, from an original idea of Collection by Anna-Célia Kendall. Comments co-written and recited by Farid Chenoune, writer and fashion historian. A production Idéale audience, Helene Le Coeur in coproduction with Arte France. "Cosi Fan Tutte" back on Arte ! On Sunday April 19th, 2015 at 23:15, Arte France will broadcast "Cosi Fan Tutte" again, staged by Michael Haneke (Oscar for Best Foreign Language Film, three Palme d’Or awards at Cannes, etc.) at Teatro Real de Madrid. A film directed by Hannes Rossacher and produced by Pierre-Olivier Bardet and Françoise Gazio. A coproduction Idéale audience, Arte France, TVE & EuroArts Music International. With the participation of ORF, Servus TV.Duration: 180 mn. Nominated for the "Cesar 2015" in the category "Best Documentary Movie". 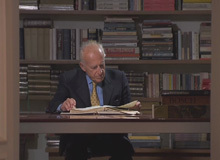 Find the conversations with the director Frederick Wiseman and the producer Pierre-Olivier Bardet. A production idéale audience and Gallery Film LLC in coproduction with Le Fresnoy Studio National des Arts contemporains. DistributionTV : Doc&Films.Distribution theatrical: Sophie Dulac Distribution (France),Zipporah films (USA). Niki de St Phalle, awarded ! The " Prix Françoise Giroud " gave the " Prize of the Television Portrait " on January 29, 2015 to Anne Julien and Louise Faure for their documentary "Niki St Phalle, an architect’s dream". Produced by Françoise Gazio/ Ideale Audience, RMN-Grand Palais, INA & AVROTROS. With the participation of France Televisions. 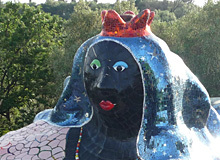 Niki de Saint Phalle won the "Best Documentary Award" for "the Art category" in Roma ! "Niki de Saint Phalle, an architect’s dream" has won the award for "Best Documentary" for the "Art category" of Video Conversations 2014 Edition on October 24th, the International Documentary Film Festival on Art and Architecture in Roma (20 > 24 October - House of Architecture). A film directed by Anne Julien and Louise Faure. Produced by Françoise Gazio/ Ideale Audience, RMN Grand Palais & INA.The film is linked to a major exhibition held at Grand Palais in Paris from mid September 2014 to the end of January 2015. On Wednesday November 26th, 2014 at 11h50 pm in "Appassionata" programme. Special evening dedicated to the Orchestre de Paris, "Esa Pekka Salonen conducts the Orchestre de Paris" with the pianist David Fray, in a program featuring Debussy’s La Mer, Ravel’s Piano concerto in G and Beethoven’s Seventh symphony. Filmed at Salle Pleyel in June 2011. Directed by Sébastien Glas. Produced by Pierre-Martin Juban. In association with : France Televisions, Mezzo et Museec. on Concert.arte website till January 4th, 2015 ! "National Gallery" now on large screens ! Selected at "la Quinzaine des réalisateurs" last May, National Gallery directed by Frederick Wiseman is now on large screens from october 8th, 2014. National Gallery of London is one of the biggest world museums with its 2400 paintings of the 13th to the end of the 19th century. All the human experiences are represented in the works which it shelters. The movie shows us visitors, guides, curators, researchers and commissioners in their work. It explores the relation between painting of the past centuries and the cinematic story of today and evokes the beautiful, the sublime and the preservation. A production Idéale Audience and Gallery Film LLC in coproduction with Le Fresnoy Studio National des Arts contemporains. Distribution TV : Doc&Films. Distribution theatrical : Sophie Dulac Distribution (France) Zipporah films (USA). On November, 9th, 2014 à 1.am on Arte France with Paul Groves (Admète) and Angela Denoke (Alceste) Teatro Real Orchestra & Choir under the baton of Ivor Bolton. 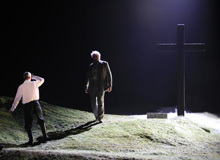 Stage director Krysztof Warlikowski, directed by Stéphane Metge.Filmed on March 4th & 7th, 2014 at Teatro Real Madrid. A production by Idéale Audience, Françoise Gazio, in co-production,TVE & Teatro Real Madrid with the participation of Arte, France Télévisions and NHK. On Sunday September 28, 2014 at 9:10 am on France 5. Second broadcast will be on October 18/19 at 1:15 am. An documentary directed by Anne Julien & Louise Faure at the occasion of the exhibition "Niki de Saint Palle" at Grand Palais Museum in Paris (Sep,17, 2014 - Feb 2, 2015). A production by Françoise Gazio, Idéale Audience, in co-production with RMN- Grand Palais & INA and the participation of France Televisions. DVD released (Coedition Rmn/ France Télévisions). Wednesday September 3rd, 2014 at 23h 30. On August 20, 2014 at 22:25! Directed by Pier Paolo Giarolo, this documentary has been selected in numerous festivals and won several awards such as : "Genziana d'argento for the best artistic and technical contribution" and "Premio Solidarietà" au Festival de Trento, « Audience Award » at Detour film festival, “Prix de Public” of National Geographic France in Autrans, "Special Mention" at Rencontres du Cinéma Italien in Toulouse et recently nominated at World Mountain Documentary Festival of Qinghai China. In the Peruvian Andes, between the sky and the clouds, books walk as people walk. A production with Idéale Audience,- Miramonte Film. in coproduction with ARTE France, In association with CaravellaFilm, in partnership with SRF Schweizer Radio & Fernsehen, RAI - Sender Bozen. Annecy Classic Festival : about 10 live concerts ! For its 5th edition, the Annecy Classic Festival, organized by Franco-Russian duo Pascal Escande and Denis Matusev, again hosts the St Petersburg Philharmonic Orchestra conducted by Zoltan Kocsis and Yuri Termikanov. 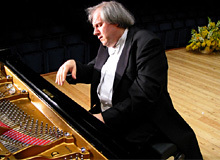 The programme will prominently feature Liszt and Brahms, to the undoubted delight of all true music lovers. Verbier Festival 2014 : Next broadcasts live captured by Ideale Audience ! 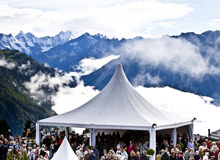 July 18 – August 3, 2014 Verbier Festival : 20 live concerts and more ! The 21st edition of the Verbier Festival will focus strongly on vocal music this year, featuring four evenings devoted to opera, and recitals galore. Vittorio Grigolo, Thomas Hampson, René Pape, Eva Maria Westbroek, Ramon Vargas and Rolando Villazon will be performing alongside rising stars Atalla Ayan, Thiago Arancam, Regula Mühlemann and Pettry Yende. There will be no shortage of instrumentalists and conductors, either, with the likes of Martha Argerich, Evgeny Kissin, Daniel Hope, Arabella Steinbacher, Daniil Trifonov Grigory Sokolov, Joshua Bell, Yuri Temirkanov, Marc Minkovski, and many more making these three weeks in Switzerland the global musical event of the year. JULY 16, 2014 at 8pm at Théâtre du Jeu de Paume. Opera by Giuseppe Verdi broadcast live ! The famous French filmaker Benoît Jacquot directs for stage and television a new production of "Traviata" at Opera de Paris. Diana Damrau is Traviata. Filmed on June 14 & 17, 2014 at Paris National Opera - Bastille. In co-production with : Idéale Audience, Opéra National de Paris, Mezzo. 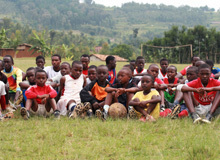 Twenty years after the genocide, Eugene Murangwa the former goalkeeper of the National Football Team of Rwanda returns to his native country.In association with former teammates who sheltered him during the 1994 genocide, Eugene created a football academy in Kigali. His involvement with the youth is prompted by his commitment to rebuild the bonds ruptured by decades of hatred. A film directed by François-Xavier Destors & Marie Thomas-Penette. Maurizio Pollini “Man and Master”(working title), a unique film portrait of the famous Italian pianist, has been selected to compete at the Festival international des Programmes Audiovisuels (21-26 January 2014, Biarritz, France) and the International Festival Films on Arts (20-30 March 2014) in Montreal. Classical music lovers everywhere are eagerly awaiting these two events! 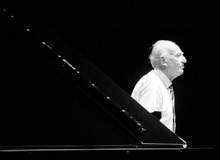 Maurizio Pollini, felt himself that the time had come to submit to the probing of the camera, an exercise made all the more necessary because of his usual avoidance of the public eye. Directed by Bruno Monsaingeon and co-produced by Idéale Audience, Arte France and SRF. Idéale Audience recorded a new production of The Indian Queen, Henry Purcell’s latest opus, revised, staged and directed by Peter Sellars with Perm Opera’s MusicAeterna orchestra and choir conducted by Teodor Currentzis, at Teatro Real in Madrid. The performance has been broadcast live on Mezzo in November, 19. This is the third production recorded this year by Ideale Audience at the Teatro Real after the Phil Glass’ latest opera Perfect American, and Cosi fan Tutte staged by Michael Haneke. In coproduction with the Teatro Real, TVE, Mezzo and with the participation of France Televisions & Culture Box. Throughout more than two hours, the huge pianist Grigory Sokolov performs Schubert, Beethoven and Rameau repertoires which keeps the listeners enthralled with its extraordinary intensity. This secretive pianist transmits to the audience a formidable presence on stage. 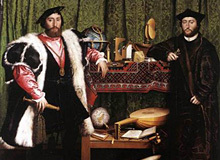 A performance filmed by Bruno Monsaingeon and coproduced by Idéale audience & medici.tv. Program includes: Schubert 4 impromptus D 899, 3 Klavierstücke D 496 - Beethoven piano sonata n°29 Op. 106 Hammerklavier – J-Ph Rameau, suite in D (5 encores) – Brahms, intermezzo op 117 n°2. Now both at the editing stage, Idéale Audience is producing two major feature length films by famous American documentarist Frederick Wiseman and Russian filmmaker Alexander Sokurov. 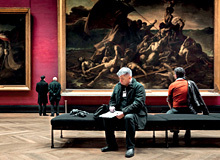 National Gallery by Frederick Wiseman has chosen to capture life of the famous museum in London, pursuing his exploration into the institutions undertaken since its first movie in 1967. A coproduction with Zipporah Films. Francofonia, by Alexander Sokurov explores the question of relations between art and war, through a fantastic journey into Le Louvre. A coproduction with zero one film, N279 Entertainment, Arte France Cinéma and Musée du Louvre. With the participation of Arte France. The acclaimed documentary Bloody Daughter, directed by Stéphanie Argerich, will be broadcast on ARTE in December, 18, at 10.45pm. This film is an intimate family portrait of two giants of the classical music world: Martha Argerich and Stephen Kovacevich. It explores the relationship between a “goddess” mother and her three daughters. Bloody Daughter has won FIPA D’OR 2013 and ITALIA Prize 2013 and has been selected in many festivals. An Idéale Audience & Intermezzo Films production, in coproduction with Arte France, TSR, SF.